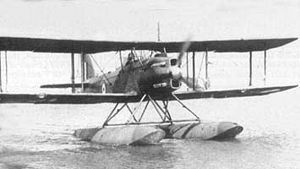 The Fairey Seafox was a 1930s British reconnaissance floatplane designed and built by Fairey for the Fleet Air Arm. It was designed to be catapulted from the deck of a light cruiser and served in the Second World War. Of the total built two were finished as landplanes. Fairey Seafox was built to satisfy Air Ministry Specification S.11/32. The prototype appeared in 1936, first flying on 27 May 1936, and the first production versions were delivered in 1937. The flights were organised as 700 Naval Air Squadron of the Fleet Air Arm. The fuselage was of all-metal monocoque construction, the wings were covered with metal on the leading edge, otherwise fabric. It was powered by a 16-cylinder 395 hp (295 kW) air-cooled Napier Rapier engine. It reached speeds of 106 mph (171 km/h), had a range of 440 mi (710 km). A criticism of the Seafox was although the aircraft handled well, it was underpowered, engine cooling was poor, and landing speeds were higher than desired. In 1939, a Seafox played a part in the attack on the German pocket battleship Admiral Graf Spee by spotting for the naval gunners. This led to the ship's destruction after the Battle of the River Plate. They were utilised up until 1943. The Seafox was operated during the early part of the war from the cruisers HMS Emerald, Neptune, Orion, Ajax, Arethusa, and Penelope and the armed merchant cruisers HMS Pretoria Castle, Asturias, and Alcantara. "For Light Reconnaissance" (PDF). Flight, 9 December 1937. pp.570-574. Mondey, David. The Hamlyn Concise Guide to British Aircraft of World War II. London; New York: Aerospace Publishing Ltd., 1982. P.87. ISBN 0600349519, ISBN 0600349675.